The new president of Brazil has put forward a plan to revamp the country's pension system - tackling a reform considered critical to boosting growth of South America's biggest economy. Many previous governments in Brazil have tried but failed to reform the country's pension system, which is running large deficits, a situation expected to worsen in coming decades as the country's population ages. Brazil economy: Can Bolsonaro ride the 'Bullsonaro wave'? "We need to change the rules of the pension system," said Leonardo Rolim, the official responsible for pensions at the Economy Ministry. "People are living longer and women have fewer children, which means that the working population will decrease." 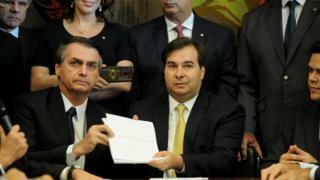 Mr Bolsonaro has also proposed increased contributions from wealthier taxpayers and creating a more private system of individual savings accounts, funded by employees, as another alternative.